In order to deliver higher and continuing education and meet the needs of the community, University of Bahamas has gradually expanded its physical presence throughout the Bahamian archipelago. In addition to its three campuses in New Providence and Grand Bahama, UB has a thriving research facility on the island of San Salvador and satellite locations that offer continuing education in Abaco and Exuma. The principal campus of UB is located at Oakes Field in the capital city of Nassau. Situated within two miles of the centre of Nassau, this urbanized campus covers approximately 60 acres and comprises administration and teaching facilities, student and ancillary service facilities and academic units. Also located at the Oakes Field Campus are the Harry C. Moore Library and Information Centre, the Department of Continuing Education and Lifelong Learning and Chapter One Bookstore. A stone’s throw away from historic downtown Nassau and adjacent to the government-operated Princess Margaret Hospital, UB’s 3.7-acre Grosvenor Close Centre (GCC) houses programmes in Nursing and Allied Health. The Hilda Bowen Library is also located at GCC. As early as 1976, the University of The Bahamas (formerly College of The Bahamas) established a presence in Grand Bahama. In 1986, after a decade of programme expansion, the Freeport Centre was established to meet the higher education needs of Grand Bahamians. In 1996, this Centre had evolved to become the University of The Bahamas-North (UB-North) dedicated to serving the higher education needs of persons from the Northern Bahamas, that is from Grand Bahama, Bimini, Abaco and the Berry Islands. Envisioned as the impetus for the development of the surrounding community and the expansion and diversification of the Bahamian economy, the Grand Bahama Port Authority gifted a 50-acre parcel of land on East Sunrise Boulevard for a state-of-the art residential campus. In 2010, the first newly constructed building of the now relocated University of The Bahamas-North was officially opened. This Campus presents a unique opportunity for partnerships and growth. Currently, NBC’s physical footprint comprises administrative, academic and student services with a residential facility scheduled for occupancy Spring 2017. 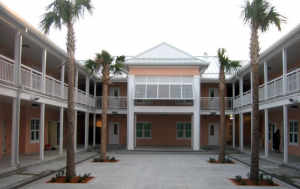 While the administrative office location is in Marsh Harbour, Abaco, the Abaco Central High School is where continuing education and lifelong learning programmes are delivered. The operation in Abaco is the newest Family Island centre and in recent years has become the most active in meeting the skills and general interest needs of the Abaco population. The first UB-operated satellite campus outside New Providence, the Exuma Centre is located at the 6-acre campus of the Exuma Foundation in Hooper’s Bay, Exuma and enjoys a longstanding partnership with the founders of the non-profit Chris and Jennifer Kettel. The Exuma Centre is the longest-running and historically most active of UB’s Family Island centres. Started by Jennifer Kettel in the early 1990s, the Centre reached its zenith in 2000 when it became the first Family Island centre from which students graduated with bachelor degrees. The Centre has thrived over the years as residents continue to purse academic upgrading, personal and professional development courses.